BACKGROUND: Tuberculin skin test (TST) and interferon gamma release assays (IGRAs) are both recommended for routine screening of healthcare workers (HCWs) in low tuberculosis (TB)-burden countries. More recently, based on scarce data, the World Health Organization strongly recommended that IGRA should not be used for occupational screening in high-burden settings. OBJECTIVE: To assess the prevalence of latent tuberculosis infection (LTBI) determined among highly exposed HCWs and low-exposed medical students in Johannesburg, South Africa. METHODS: We performed a cross-sectional study using both TSTs and IGRAs to determine the prevalence rate of LTBI in 79 medical students and 120 HCWs providing HIV and/or TB care. RESULTS: The prevalence of LTBI among HCWs was 2- to 4-fold higher than that among medical students (56.7% v. 26.6% TST-positive; 69.2% v.15.2% IGRA-positive, respectively), with 3-fold higher odds for TST positivity and 12-fold higher odds for IGRA positivity among HCWs compared with students. Despite the perception of being at high risk, few HCWs protected themselves against LTBI. The majority of HCWs reported that they would participate in annual TST or IGRA screening. CONCLUSION: Infection control strategies and occupational screening programmes for professional and lay HCWs, as well as medical students, should be implemented in all high-burden settings. Further research is needed to determine whether IGRA or TST is the optimal assay for periodical screening of HCWs in high-burden settings. In the 1950s, epidemiological studies in the USA and Europe established tuberculosis (TB) as an occupational hazard, with a increased risk of infection among healthcare workers (HCWs) and paramedical staff compared with the general population. In contrast, occupational TB in developing countries remains a poorly documented problem, but the emergence of extensively drug-resistant TB in HCWs has renewed interest in protecting HCWs in high-burden settings. 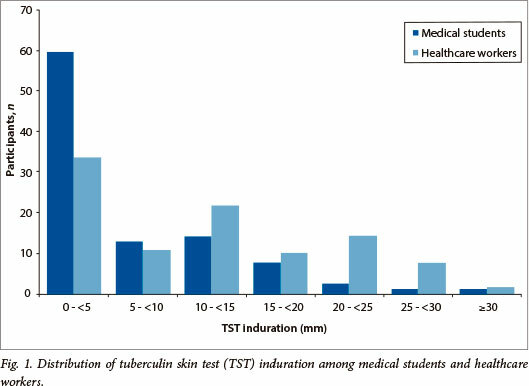 The prevalence of latent tuberculosis infection (LTBI) has traditionally been estimated using the tuberculin skin test (TST), with estimates among HCWs in low- and middle-income countries ranging from 33% to 79%. The TST may overestimate the prevalence of LTBI as it detects lifetime cumulative occupational and non-occupational exposure to Mycobacterium tuberculosis, as well as the effects of exposure to non-tuberculous mycobacterial and Bacillus Calmette-Guérin (BCG) vaccination, especially if BCG is administered more than once or after infancy. Furthermore, TST suffers from interobserver variation and a boosting phenomenon if used repeatedly. The interferon gamma release assays (IGRAs), which measure interferon gamma production in whole blood in response to the M. tuberculosis-specific antigenic targets ESAT-6 (6kDa early secreted antigenic target) and CFP-10 (culture filtrate protein-10), may provide more valid estimates of LTBI in HCWs. In 2010, the US Centers for Disease Control and Prevention recommended that both IGRA and TST can be used for periodic screening of HCWs. To (i) assess the prevalence of LTBI among medical students and other highly exposed HCWs in South Africa (SA) using IGRA and TST; (ii) determine factors associated with LTBI; and (iii) assess the risk perception of LTBI in these individuals. This cross-sectional study was part of a larger study of HCWs in Johannesburg, SA. Medical students starting their first year of full-time clinical training were selected because of their low risk of past occupational exposure to M. tuberculosis. Nurses, doctors and counsellors caring daily for patients with active TB or people living with HIV were selected because of their high risk of frequent exposure to M. tuberculosis. Individuals were not eligible for participation if they reported cough for ≥2 weeks, were receiving treatment for active TB at the time of enrolment, or refused HIV testing. All participants provided written informed consent. The study was approved by the ethics review committees of the University of the Witwatersrand and the University of North Carolina at Chapel Hill. Sociodemographic information was collected using a self-administered questionnaire. A non-occupational contact was defined as a friend or family member who had been diagnosed with TB. An LTBI knowledge score (0 - 14) was calculated based on responses to questions on transmission of M. tuberculosis and prevention thereof, diagnosis and course of LTBI, isoniazid preventive therapy, and the effects of HIV and BCG vaccination on TST. Participants were also asked how they viewed their risk of past and future LTBI, their risk of active TB, and their willingness to participate in routine TST or IGRA-based occupational LTBI screening programmes. HIV testing was performed using an enzyme-linked immunosorbent assay (ELISA) following individual pre-test counselling. Post-test counselling was performed at the next study visit, 24 - 72 hours later. Individuals diagnosed with HIV were referred for care. The QuantiFERON-TB Gold In-tube (QFT-GIT) IGRA assay (Celestis, Australia) was performed according to manufacturer's instructions at a research laboratory based at the University of the Witwatersrand. A positive QFT-GIT test result was defined as a value ≥0.35 IU/ml for the corrected TB antigen-stimulated plasma level as calculated by the manufacturer's software. A TST was conducted by injecting two tuberculin units of purified protein derivative (PPD) RT23 intradermally on the volar side of the forearm after blood was drawn for the QFT-GIT and HIV ELISA. The TST was read by one of two investigators 48 - 72 hours after placement and considered positive if induration was ≥10 mm in HIV-negative individuals or ≥5 mm in HIV-positive individuals. Pearson's χ2 test and Student t-test were used to compare proportions and means between groups. Agreement between TST and IGRA was quantified using the κ statistic. Unadjusted odds ratios (OR), adjusted odds ratios (aOR) and their 95% confidence intervals (CIs) for risk factors associated with LTBI were calculated by multivariate logistic regression using separate models for IGRA or TST outcomes and separate models for medical students and HCWs. Nurses and doctors were collapsed into a single category of professional HCWs. Variables with p-values <0.20 in bivariate analysis were included in the initial multivariate model and removed by a backwards elimination process. In total, 79 medical students and 120 HCWs were enrolled. Of HCWs, 73.3% were nurses. Compared with medical students, HCWs were more likely to be female and older (both p<0.0001) (Table 1). 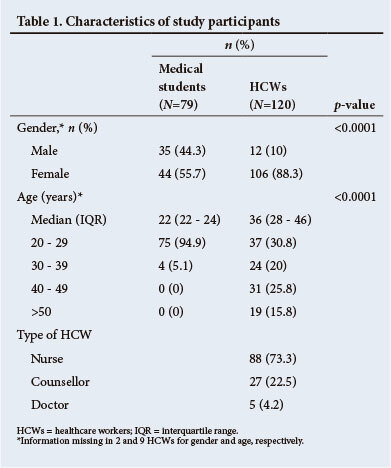 None of the medical students and 18.3% (22/120) of HCWs were HIV-positive (Table 2). A greater proportion of counsellors were HIV-positive than professional HCWs (44.4% v. 10.8%, respectively; p<0.0001). Almost half (48.2%) of all participants reported a non-occupational TB contact, and HCWs were more likely than medical students to report such contact (52.2% v. 41.8%, respectively; p=0.03). HCWs had a lower median LTBI knowledge score than medical students (7 v. 9, respectively; p<0.0001). Overall, 44.7% (89/199) of participants had a positive TST and 47.7% (95/199) had a positive IGRA. The prevalence of LTBI as measured by TST was higher among HCWs than medical students (56.7% v. 26.6%, respectively; p<0.0001). The distribution of TST induration for medical students and HCWs is shown in Fig. 1. HCWs were more likely than medical students to have a positive IGRA result (69.2% v. 15.2%, respectively; p<0.0001). The prevalence of LTBI was similar in professional HCWs and counsellors. 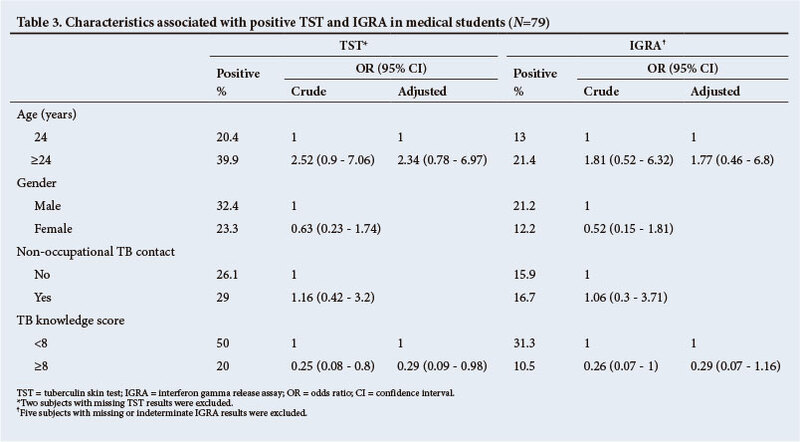 More medical students were positive on TST than on IGRA (26.6% v. 15.2%, respectively; p=0.08), whereas more HCWs were positive on IGRA than on TST (69.2% v. 56.7%, respectively; p=0.045). When comparing the medical students with low exposure to the highly exposed HCWs, the association between intensity of occupational exposure and test positivity was stronger for IGRA (OR 12.25; 95% CI 5.88 - 25.51) than TST (OR 3.56; 95% CI 1.91 - 6.60). The agreement between TST and IGRA was fair (68.4%, κ=0.37). Among medical students, older age (≥24 years) tended to be associated with a positive TST (aOR 2.34; 95% CI 0.78 - 6.97) and positive IGRA (aOR 1.77; 95% CI 0.46 - 6.80), but these differences did not reach statistical significance (Table 3). 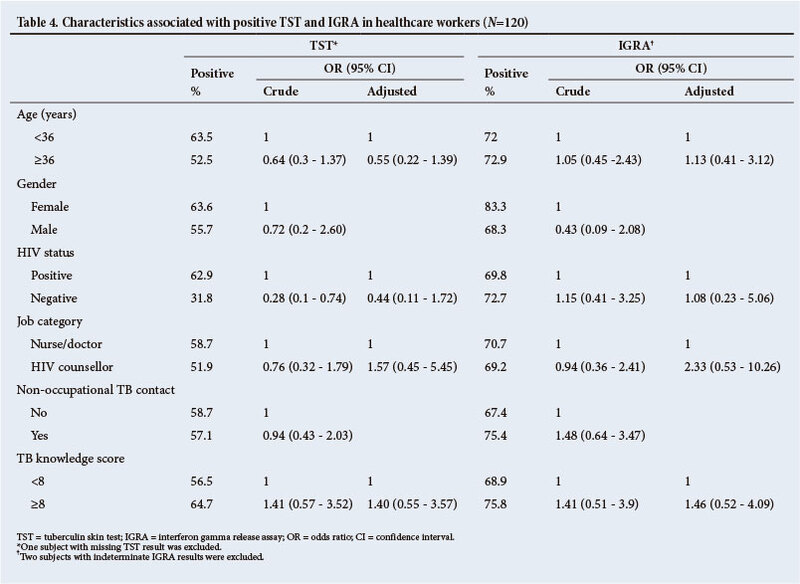 Report of a non-occupational TB contact was also not associated with a positive TST or IGRA (OR 1.16; 95% CI 0.42 - 3.2 and OR 1.06; 95% CI 0.30 - 3.71). Having a TB knowledge score >7, the median score for all participants, reduced the odds of a positive TST or IGRA by >70%. In multivariate analysis, this association remained statistically significant for TST (aOR 0.29; 95% CI 0.09 - 0.98) but not for IGRA (aOR 0.21; 95% CI 0.07 - 1.16). Among HCWs, the only association in unadjusted analysis was between HIV status and TST result, with HIV-uninfected HCWs being less likely to have a positive TST (OR 0.28; 95% CI 0.10 - 0.74), but this association was no longer significant after adjustment for age, job category and TB knowledge score (Table 4). Among HCWs, LTBI knowledge score was not associated with a positive result for TST and IGRA. Among those who completed the risk assessment questionnaire (83% of students and 30% of HCWs), 27.5% of medical students and 65.7% of HCWs believed they were likely or highly likely to have LTBI, and the majority of students (75.4%) and HCWs (70%) believed it was likely or highly likely that they would acquire LTBI in the next 5 years. Few medical students (16.1%) but many HCWs (52.9%) perceived their risk of developing active TB as likely or highly likely, and 30% of HCWs even believed it was likely they could die of TB. Despite this high-perceived risk, most HCWs (85/111 or 76.6%) reported that they did not take any measures to protect themselves against TB. Acceptance of a potential, future, free annual occupational screening programme was high, with 90% of medical students and 88% of HCWs reporting they would participate in a TST screening programme, and 96% of medical students and 92% of nurses reporting they would participate in an IGRA screening programme. 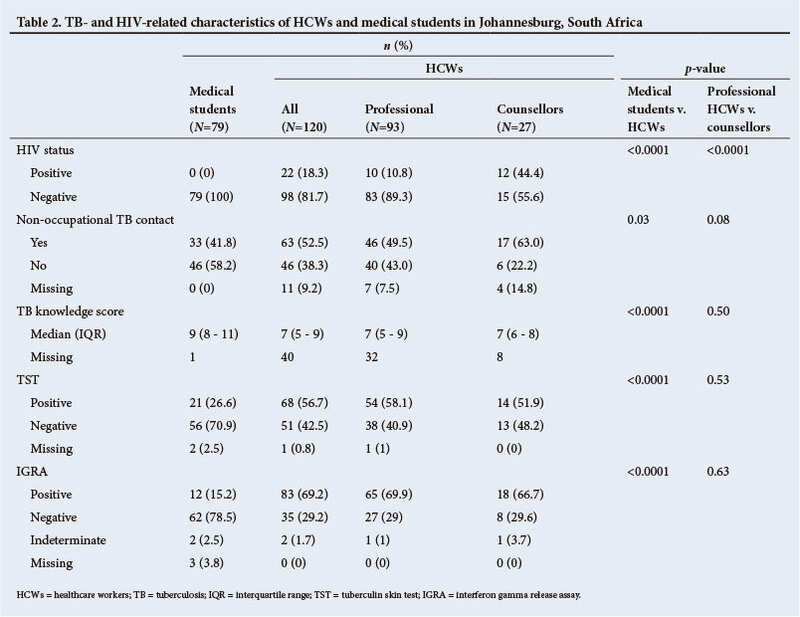 In Johannesburg, SA, the prevalence of LTBI among HCWs providing care for people with TB and/or HIV was 2- to 4-fold higher than that among medical students finishing their theoretical studies (56.7% v. 26.6% TST-positive; 69.2% v. 15.2% IGRA-positive, respectively), with 3-fold higher odds for TST positivity and 12-fold higher odds for IGRA positivity among highly exposed HCWs compared with less exposed medical students. Except for better knowledge of LTBI in medical students, participant characteristics such as age, non-occupational contact, job category, or HIV status were not associated with LTBI (defined as either positive IGRA or TST) among medical students or HCWs. The 26.6% TST prevalence among SA medical students recruited at the end of their theoretical training was similar to the 27.1% TST prevalence observed in Zimbabwean nursing students recruited at the start of their training. No data have been published on the prevalence of positive IGRA results among medical or nursing students in SSA. The 15.2% IGRA positivity prevalence rate among medical students was, however, low compared with the 65 - 78% IGRA positivity rate among household contacts of a TB case in SA communities, especially given the report of non-occupational TB contact in 42% of the medical students in our study. This could be due to a longer timespan between contact with a TB case and IGRA in the medical students, higher HIV prevalence rate among household contacts, and higher socioeconomic status of medical students. More HCWs were IGRA-positive than TST-positive, whereas more medical students were TST-positive than IGRA-positive. IGRA-negative/TST-positive discordances have been observed in all studies of HCWs in low-burden settings, and IGRA positivity was also slightly lower in the only two published studies of LTBI in HCWs in high-burden settings,[7,8] with the difference being significant only in one study. High rates of IGRA-positive/TST-negative discordances have not yet been reported in HCWs but were observed in adult and childhood contacts of new TB cases. [11,13] Similar to the study in India, which found a stronger, albeit non-significant, association between occupational risk and IGRA v. TST positivity, we observed a significantly stronger association between level of occupational risk and IGRA positivity than occupational risk and TST positivity (OR 12.25 for IGRA v. 3.6 for TST). These observations support the hypothesis that IGRA may detect more recent infection (involving CD4+ T-cells of the effector memory phenotype that have recently encountered antigens in vivo), whereas TST detects cumulative exposure to M. tuberculosis over a person's lifetime (involving CD4+ T-cells of the memory phenotype). Given the repeated nature of occupational screening programmes, test performance is an important determinant, but perceived risk of LTBI and acceptability of the test may also determine the success of such programme. We found that most HCWs perceive themselves to be at high risk of LTBI and active TB, yet few take measures to protect themselves. Almost all, reassuringly, indicated their willingness to participate in an annual occupational TST or IGRA-based screening programme. While our study is important, as it is the first study to assess both IGRA and TST in medical students and highly exposed HCWs in SSA, there were several limitations shared with other cross-sectional studies of LTBI in HCWs: (i) distinguishing occupational from non-work-related infection was not possible; (ii) owing to the lack of a gold standard for diagnosing LTBI, the cause of discrepant results between IGRA and TST cannot be assessed; (iii) due to the cross-sectional nature of the study, it was not possible to determine the predictive value of a positive IGRA or TST result in predicting progression to active disease. The high LTBI prevalence rates among HCWs, in addition to the 11% HIV prevalence rate among nursing staff, highlights the urgent need to prioritise implementation of infection control strategies and establishment of occupational health programmes in high TB-burden settings. The high rates of TB and HIV co-infection observed among HIV counsellors underscore the need for inclusion of lay workers in occupational screening programmes. The relatively low prevalence rate of LTBI in medical students at the end of their theoretical training exposes their risk of M. tuberculosis acquisition during practice, and underscores the need for screening programmes similar to those in medical schools in high-resource settings. In 2010, based on limited data and in the absence of any data from SSA, a World Health Organization Expert Committee strongly recommended that IGRAs should not be used in HCW screening programmes in high-burden settings. Our findings of a stronger association between IGRA and occupational risk compared with TST suggest that the choice of assay for occupational screening programmes in high-burden settings requires further study. Acknowledgements. We thank P Keller and M Tellie for their contributions. We are grateful for the funding received from the North Carolina Occupational Safety and Health Education Research Center (grant no. T 42 OH 008673) and the United States Agency for International Development (USAID)/the US President's Emergency Plan for AIDS Relief (PEPFAR). We thank all participants for their time and dedication to this study.